You know that you’re going to experience some of the best, the brightest, and the shiniest when you visit the Getty. The current manuscript exhibit delivers some pretty shiny manuscripts, plus a hefty load of big bright ideas. I was fortunate to receive a tour of the exhibit from curatorial assistant Rheagan Martin, and curatorial intern Alexandra Kaczenski, who provided abundant insight into the themes of the exhibit and pointed out exquisite details of the selected art pieces. Traversing the Globe Through Illuminated Manuscripts will be open from January 26-June 26, 2016, and examines the concept of a Global Middle Ages through geography, religion, trade, and art. Bryan C. Keene, assistant curator of Manuscripts at the Getty and primary curator of the exhibit, focuses on medieval narratives aside from conflict, Christianity, and monarchs. When considering East versus West, the Crusades are a popular topic yet there are a multitude of components to consider as Keene illustrates in his thoughtful pairings and comparative displays of material created in the 9th-17th centuries. 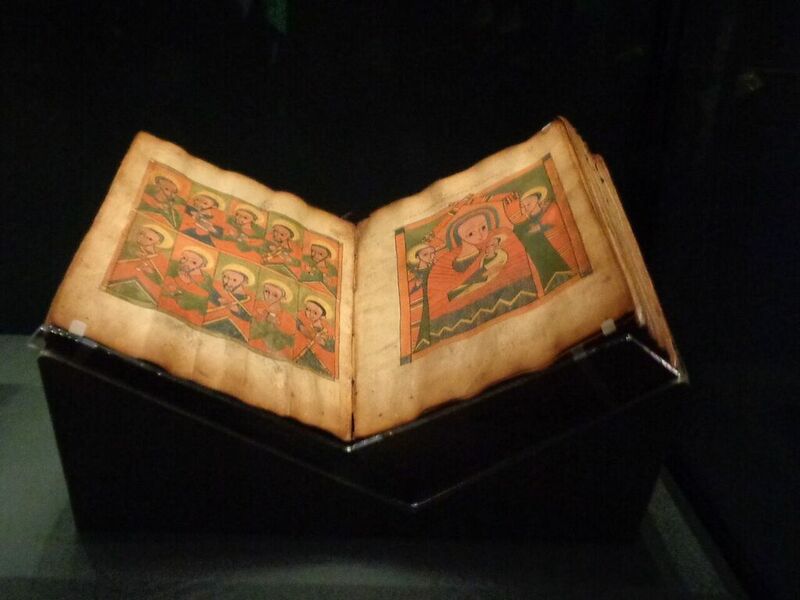 Traversing the Globe will be open for six months, longer than most of the manuscript exhibits at the Getty. On April 12, 2016, many of the manuscripts on display will (ahem) turn over new leaves. This minimizes potential damage to the text and illustrations. The turn-over in April presents a distinctive challenge to the curatorial staff. It made the original selection of manuscripts more difficult, to ensure that multiple leaves would fit the exhibit’s themes, but it does require certain displays to have new labels produced. The additional planning pays off in extending the life of the overall exhibit by increasing the amount of time the manuscripts are exposed to light and exhibit conditions. The longer exhibit life also allows visitors the opportunity to view some special pieces on loan from multiple organizations, including the Los Angeles County Museum of Art, the Norton Simon Museum, the Huntington Library, private collections, and the Charles E. Young Research Library at UCLA. This exhibit is all about telling alternative narratives and expanding the average visitor’s understanding of the Middle Ages and early Renaissance. Keene is aiming to both broaden and deepen awareness using geography, comparison, and related artistic motifs as his tools. The exhibit is in two galleries connected by a central atrium. The central space houses a large platform with a map graphic. This platform provides an overview of the exhibit’s central themes, and uses spotlight pieces to illustrate the geographic spread of the artworks’ origins. It really is a global representation, with art in multiple media from modern-day India, China, Armenia, Italy, Ethiopia, Mexico, and more. The inclusion of this display in the central atrium really connects the two galleries; without it I think many visitors would gloss over the related themes in the two rooms. It is also one of the few manuscript exhibits to extend into two galleries, so thank you to the Getty for supporting medievalism! One gallery was organized geographically, while the second gallery was organized by themes of religion, trade, and transmission. While a multi-faceted exhibit can reach a diverse audience, this seemed to be ever-so-slightly overreaching in its attempt to include multiple narratives. I applaud Keene’s ambition to show the true diversity of the Middle Ages but the average visitor may be overwhelmed or need multiple visits to really grasp the scope of the exhibit (or need some prior knowledge of medieval history!). He touches on the transmission of materials, symbols, and religion; he illustrates the misconceptions and comical depictions of far-away cultures and creatures, shows diplomatic relations, provides examples of historic theories of geography and cartography, and encompasses evidence of trade and peaceful exchange, plus more. Traversing the Globe contains a lot of information; there are so many sub-themes illustrated that the average visitor may lose track of the main concept. You can be overwhelmed by too much good stuff in this exhibit; it’s like a giant burrito: everything in it is really tasty but it’s a LOT of good stuff! Perhaps I’m wrong, and visitors are delighted by the rich context. I hope that most visitors are charmed by many of the wonderful and unique pieces in this exhibit, regardless of their intellectual take-away. I know I definitely enjoyed the diversity and the attention paid to less-common narratives. Trade and exchange is an important facet of the exhibit content and selected pieces provide evidence of political, economic, and artistic exchanges. Manuscripts were extremely expensive to produce, yet they were a relatively portable commodity. This made them ideal tools for use in diplomatic relations and communicated academic, religious, and artistic principles. The transmission of the çintamani, an artistic element, was glaringly obvious in the comparison of a manuscript from Istanbul and a chausable front from Venice both from the early 16th century. The çintamani, originating in a Hindu or Buddhist context, is used in multiple media and only becomes prevalent in Europe during the Middle Ages. Nearby, illuminated parchment medallions with text from the Qur’an and the Shah Abbas Bible with Arabic marginalia are further evidence of cross-continental exchange. While many objects and materials were successfully exchanged in the Global Middle Ages, some ideas, concepts, and descriptions of foreign wonders didn’t always make the trip with a high level of integrity. Several manuscripts from various locations and centuries offer very diverse interpretations of elephants, including one closer to a dog than a large pachyderm! An early print published in Germany in 1486 provides a helpful Arabic alphabet, along with a somewhat fanciful illustration of “Saracen” costume. The ambiguously draped tunics and turbans have somewhat of a fantasy element to them, and the viewer can’t help but think that the artist used his imagination rather than an accurate description. The online media support is fantastic and includes the illustrated exhibit checklist and Medieval Manuscripts Live, an audio guide which provides opportunities to hear the text of manuscripts read aloud in original languages. You can access Medieval Manuscripts Alive from your home or your phone, which means you can bring it right into the gallery and hear Old French or Medieval Arabic as you’re looking at the 9th century Qur’an with gold-leaf lettering! You can explore the exhibit and related materials online at this website or visit in person at the Getty through June 26, 2016. Plan your visit using this information. *All photos property of the author.